SURVIVE! ESCAPE FROM ATLANTIS is an amazing adventure board game! It is currently ranked #27 in the Top 100 family board games of all time. 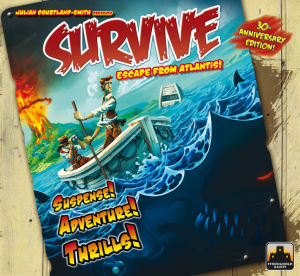 The game stirs up real thrills and excitement as you attempt to rescue people from the sinking island of Atlantis, which is also threatened by an active volcano. The island is made up of 40 hex-tiles and is slowly sinking into the ocean (as the tiles are removed from the board). Each player controls ten people (valued from 1 to 6) that they try and move towards the safety of the surrounding mainland shore before the island sinks or the active volcano finally blows up. Players can either swim or use boats to travel but must avoid sea serpents, whales and sharks on their way to safety. Survive is an easy game to learn. You can only do a few basic things each turn. As the island sinks, the pressure really heats up and it makes the game very exciting. If you are looking for a family-style game that is both light and fun, Survive is meant for you! In order to accommodate up to 6 players, the game comes with one key expansion: Dolphins & Squids Expansion. NOVA Board Game Group uses this expansion during our play sessions so more people can join the game. Watch the videos below for more details on how to play the game (including the expansion).